Would you like to find “without stress” a parking spot in the city center? Geneva shows you the solution! TV channel SRF1 announces in 10vor10 the intelligent solutions of the swiss company IEM. This film report explains how to find and pay for your on-street parking through the PrestoPark mobile application, connected in real time to PrestoSense vehicle detection sensors. Furthermore, these data can be integrated into the urban parking guidance system and thus inform motorists of the available parking spaces in the car parks and on the road as well. 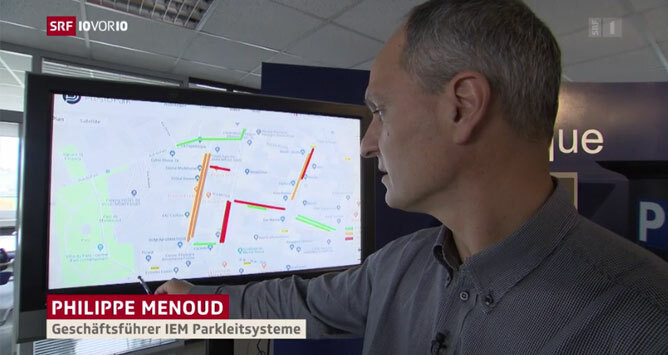 PrestoSense sensors provide the city with important data on how users behave in their parking mode, providing information such as the number of parking lots, the duration of parking and the payments made by them. This allows the city to optimize its parking policy in a targeted and efficient manner, to reduce the traffic generated by the search for free parking and to measure the use of parking solutions. Several cities already benefit from this “smart” solutions. IEM is the leading designer and manufacturer of intelligent parking solutions in Switzerland through intelligent parking meters, parking sensors, a user application and a control application with an operator portal.